Tired and with tears in their eyes, the 14 surviving players from the High School of Art & Design basketball team started to sway to the music, tentatively at first against the fast beat coming from the speakers. As the crowd clapped and shouted encouragement, they picked up the pace, moving together, stepping in time over the painting on the floor of a bulldog, the school's mascot, as they formed a circle and danced in the middle. Karim Felder, Andrew Griffith and Kimani Gibbs held out their jerseys as they danced. 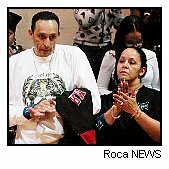 Alejandro Rivera, DJ Ortega, Benny Paulino and Anthony Sanders held up their hands, the forefinger and thumb of each hand making an "L."
As they danced, they cast quick glances across the court, where Luis Seda's family stood, watching, cheering, smiling and crying. They danced because Evette Seda had asked them to. She needed them to. "Because that is Luis for me now," the mother was saying, her eyes red-rimmed, her voice shaking, but a smile on her face. "That joy, that happiness, that moment. That is Luis. That is how my son lives on." Art & Design's basketball team pauses for 30 seconds of silence to honor former teammate Luis Seda, killed last month. Seda's parents, Luis Sr. and Evette (below), are also on hand. Luis Seda was killed on Dec.28 as he ran across the Hutchinson River Parkway. Filling in for a vacationing uncle at a Citgo station, he sprinted across the 12-lane highway looking to get change for a customer and was struck by a car. He was 18. On Tuesday, the 14 members of Art & Design's team postponed their PSAL Manhattan game with Seward Park and went to pay their respects to their teammate and friend. Seniors Jovan Jenkins, Sanders, Felder and Paulino carried Seda's coffin into St. Athanasius Church in the Bronx. He was buried wearing the Art & Design warm-up they'd held a bake sale to buy. "We wanted that because like he was loved at home, he was loved here. He loved it here," his mother said of the school. Most of all Seda loved basketball. Kris Spector had been Seda's baseball coach for three years and says that even though Seda never practiced baseball, he was still the second best player on the team. Spector is in his first year as the school's basketball coach. "He liked baseball but he loved basketball, you could just see it in him when he played," Spector says. "He was not the team's captain or anything, he was our emotional leader. He was the one always getting the guys together." An aspiring filmmaker, Seda also was popular among students and teachers at a school that attracts artists and creative types. His eight-minute film about young love was supposed to premiere on Tuesday. Instead the school made a space for grief counselors and his teammates said goodbye. In the school's lobby, a 10-foot by two-foot roll of sketching paper became a mural plastered with notes, dedications and drawings by the students of the midtown school. Jovan Figueroa drew a caricature of Seda featuring a large Afro, big "Luis" earrings in both ears and a huge grin. "That's who he is, always smiling, always laughing," Figueroa says. "He was always making everyone else smile. That's how we remember him." Athletic Director Arthur Bernstein wants to remember Seda's very first game. He'd been lethargic on the court. It was atypical of Seda and he was disappointed his mom and dad had seen him play that way. "He said he would never play that way again," Bernstein says. "And he didn't. He was the most energetic, hard-working kid on the court you ever saw." Seda, who played forward, went from averaging 5 points and 5 rebounds a game that year as a sophomore to 17.8 points and 6.8 rebounds a game this season. He'd played well in the Sullivan Games in the fall. It was a chance for seniors to play in front of college coaches, and he'd piqued the interest of quite a few, including those from Nazareth and Lehman. His former coach says he would have definitely played at the college level. "He had a passion for life and basketball that cannot be taught. 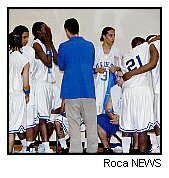 He was the type of young man that anyone would love to coach," former Art & Design basketball coach Wayne Crawford says. "He truly was an absolute pleasure to be around. On the court Luis was a terror who never backed down from a challenge. He played every game like it was his last with unbridled enthusiasm and emotion." That is the way his teammates wanted him remembered. They did not want poems or speeches. There were no flowers or black bands. The best memorial they could create for their friend was by laughing, smiling and loving the game. "We wanted to play," Paulino says. "We wanted to play hard and win. And we wanted to get it over (with)." They wanted to get past the first time they would go into the locker room without Seda there to tell them outrageous stories or just to make them laugh. They wanted to get past the first pregame meeting without him sitting in his normal spot up front. They wanted to take that first step onto the court without him gathering them together and yelling, "Yeah Boyzzzz." Friday, they played their first game since the accident. "It was hard, harder than I thought, because it really hit me, he's gone, there is no more Luis," says Paulino, who wore a T-shirt with Seda's picture on it over his jersey before and after the game. "But it was good, too. Luis was never about the past, he never would stay on what had happened. He was about what was happening and the future." "Now, we have to carry him into the future," Andrew Giffith said. His teammates played urgently in the first half, at a pace anyone would have trouble keeping up with. Before the start of the second half, school principal Scott Feltzin asked for the crowd to stand and remember "our beloved Luis," as the game clock counted down from 33 seconds - the number Seda wore on the court. The team then walked over to Evette and Luis Seda Sr. and gave them the memorial murals the students had created. The parents gathered in a huddle with the team as they shouted together: "Seda!" After the halftime ceremony, the Bulldogs' energy and emotions were sapped. They needed the 20-point lead they'd built in the first half to hold on for a 66-55 win over Seward Park. At 8-1 in the division with a senior-filled team, they are still hoping to make a championship run. "We are going to do it with him, with him in our hearts," Sanders said. "We'd dedicate the season to him if we felt he wasn't here with us. We still feel like he's part of this." At the buzzer Friday, the crowd erupted, running onto the court and joining the team in a manic celebration. As the crowd calmed, the team gathered again at center court. The players embraced Seda's parents, his family and friends. They had one last huddle and sang out his name again in unison. When Luis Seda's song, "Walk It Out," by DJ Unka, came over the speakers, his mother asked them to celebrate his life. "She wanted us to dance," says Felder, "And we did what Luis would do. We had fun. He would have been dancing and laughing with us." © 2007 Daily News, L.P.